These Scenarios are divided into the four families described on page 118 of the Manual. Six are selected as representative. ·	They may not be consistent with trends over the past 25 years. Total emissions are indeed increasing, but the rates of increase have slowed significantly, as has the carbon-intensity of the world economy. ·	They are not capturing recent experience in their short term projections. The following table (from 4AR SPM3 page 13) shows the temperatures and sea levels at 2100 in each of the Selected Scenarios. A2 assumes that world population will grow to 15 billion, and still rising, by the end of the 21st century. In 2012, nobody believes this, and the Scenario should be omitted. The UN Population Division’s Bayesian model currently suggests that we are heading for a global peak of 9-10 million by 2070, followed by an uncertain but progressive reduction. The SRES assumed that the 21st century would see no material change in the availability or price of fossil fuels – and no climate policies. We now know that these assumptions were wrong. In 1998-2000, the price of oil was in the vicinity of $14 per barrel while, in 2012, the price exceeds $100 per barrel. It must be emphasised that multi-decade forecasts are almost invariably wrong. A striking illustration is provided by the “Annual Energy Outlook” published by the US Government’s Energy Information Administration (EIA), which predicted in 2004 that US carbon emission levels would rise by 37% between 2005 and 2025. In a January 2012 update, the EIA now estimates that US CO2 emissions in 2025 will be 6% lower than they were in 2005. Not only the quantity, but even the sign, has changed dramatically in just a few years. Contrary to A1F1 assumptions, energy intensity is dropping worldwide, and at a spectacular rate. Over 6 years have passed since “urgent” reappraisal was recommended by the House of Lords, and 12 years since the scenarios were invented. Energy intensity and female fertility have fallen further, oil and gas prices have rocketed, and there has been a long global recession. For the 5AR due in 2013/14, the SRES are to be entirely replaced by four new models called Representative Concentration Pathways (“RCPs”). These do not pretend to be anything other than pure speculation. ·	Re A2 and A1F1 scenarios: 10%. This is only the sixth paper to be accepted by this organisation (and the first by an Australian) which is dedicated to the truth in science. The footnote to all the world’s major boondoggles, two stark examples at present being the NSW (Kurnell) and Victoria (Wonthaggi) desalination plants. The RCP database options are the model basis of the SRES options. The IPCC, CMIP, PCMDI etc specify model parameters for simulation runs using the RCP database i.e. they hardwire warming in the models by process of circular reasoning and a fallacious assumption that warming follows progressively increasing emission levels, variations of the guesses of which are enshrined in the RCP database. Note the conspicuous absence of natural cycles, oscillations etc except for the lonely (and relatively minor) TSI. Fallacy => Assumption => Circular Reasoning – that’s how it works folks. Sadly these regional policy statements are not attracting much attention. My local region, like the others I imagine, has hidden away in the PLAN under Sustainable Futures a Climate Change Constraints Report. Much attention and money seems to be invested in these reports which highlight some future climate catastrophe. Ten minutes on google earth will make evident the real tsunami catastrophe facing all those lovely homes built right on the sea shore. Nick Smith has been warned that the ETS is based on false information but professes to be an expert on risk analysis and insists that the government view is in the best interests of NZ. » NO reference temperature sets. “IPCC projections did not include contributions from ice sheet melt, on the grounds that we do not understand ice sheet physics well enough. That is reasonable, but if ice sheets pose the danger of sea level rise far exceeding other mechanisms, then it deserves to be front and center in communication with policymakers. Given the near impossibility of getting policymakers to consider far future effects, the practical question then becomes: how much can ice sheets contribute to sea level rise on the time scale of a century? I live by the sea, (or did) and my house was taken out by the Feb 22nd earthquake. It would seem a bigger risk in NZ than any hypothetical projection of sea level rise. “Consideration of the measured data recorded over a significant period of time shows that the sea levels are raising weakly without any acceleration component. The worldwide average tide gauge result obtained considering all the data included in the Permanent Service for Mean Sea Level data base show a modest sea level rise and about zero acceleration. The Fort Denison, Sydney tide gauge result shows the same modest sea level rise and about zero acceleration in perfect agreement with the worldwide result. The Fremantle tide gauge result, the only other tide gauge operational in Australia over more than a century, shows the same modest sea level rise and about zero acceleration in perfect agreement with the worldwide result and the result of Sydney. The other tide gauges operational along the coastline of Australia over shorter time scales of 30 to 40 years on average also show the lack of any acceleration component in the rate of rise of sea levels. And that Scafetta’s Empirical Cycle Model is is beating the pants off the CO2-driven Models of the activist/advocacy science of the UN’s IPCC, I think we can put the predictions of Hansen, Sato and Rahmstorf in perspective Nick. Some people will, of course, believe anything. It’s always good to go back to the actual data, and not just treat the various models as automatically valid. Here is a useful graphic that I put together last year when the RSNZ made similar ludicrous claims. I’ve updated it, and we’re currently tracking along on the IPCC’s lowest estimate, which was never very daring anyway. Now, does anyone really think these sea level rise claims are likely? VM09 predicts even greater rise (0.75-1.9m!) than the RSNZ . Over the last decade sea level rise has been sluggish at best. And yet we’re expected to believe that the rate will suddenly jump from around 1-2mm/yr to about 11mm/yr?! Which is what will be necessary (starting tomorrow) to reach 1m by 2100 (only 88 years to go!). When will this happen Nick? Shouldn’t sea level rise have been accelerating instead of decelerating over the past decade? Haven’t they been predicting acceleration since 1988? At what point do the models say it will kick in? Isn’t it true that the projected sea level rise was a direct result of the projected warming, and hasn’t that warming been conspicuous by its absence for the past decade? Which models predicted the lack of warming, and hence the lack of sea level rise acceleration? Is it a travesty that they can’t work out where the heat went? I would suggest that someone is deluded, and I don’t think it’s the sceptics. Alberto A., Boretti. 2012. 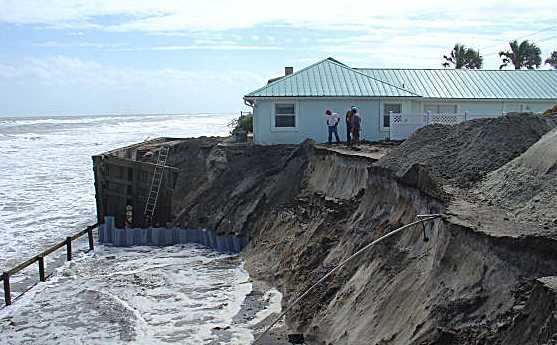 “Short Term Comparison of Climate Model Predictions and Satellite Altimeter Measurements of Sea Levels.” Coastal Engineering 60 (0) (February): 319–322. doi:10.1016/j.coastaleng.2011.10.005. Climate models (http://climatecommission.govspace.gov.au/files/2011/05/4108-CC-Science-Update-PRINT-CHANGES.pdf, 2011; http://www.ipcc.ch/publications_and_data/publications_ipcc_fourth_assessment_report_synthesis_report.htm, 2011; Rahmstorf, 2007, 2010) calculate that temperatures are increasing globally and sea level rises are increasing due to anthropogenic carbon dioxide emissions. More recent predictions (http://climatecommission.govspace.gov.au/files/2011/05/4108-CC-Science-Update-PRINT-CHANGES.pdf, 2011; Rahmstorf, 2007, 2010) have forecast that sea level rises by 2100 will be higher than the 2007 projections by the Intergovernmental Panel on Climate Change (http://www.ipcc.ch/publications_and_data/publications_ipcc_fourth_assessment_report_synthesis_report.htm, 2011), with projected sea level rises increasing from 18–59 cm to 100 cm. In this brief communication, the predictions of Rahmstorf (2007) are validated against the experimental evidence over a 20-year period. The University of Colorado Sea Level satellite monitoring shows that the rate of rise of the sea level is not only well below the values computed in http://climatecommission.govspace.gov.au/files/2011/05/4108-CC-Science-Update-PRINT-CHANGES.pdf (2011) and Rahmstorf (2007, 2010), but actually reducing rather than increasing (http://sealevel.colorado.edu/, 2011b; 10,11). These results suggest that sea level predictions based solely on the presumed temperature evolution may fail to accurately predict the long-term sea levels at the end of the century. Holgate, S., S. Jevrejeva, et al. (2007). “Comment on “A Semi-Empirical Approach to Projecting Future Sea-Level Rise”.” Science 317(5846): 1866-1866. Schmith, T., S. Johansen, et al. (2007). “Comment on “A Semi-Empirical Approach to Projecting Future Sea-Level Rise”.” Science 317(5846): 1866-1866. Rahmstorf, S. (2007). “Response to Comments on “A Semi-Empirical Approach to Projecting Future Sea-Level Rise”.” Science 317(5846): 1866-1866. Vermeer, M. and S. Rahmstorf (2009). “Global sea level linked to global temperature.” Proceedings of the National Academy of Sciences 106(51): 21527-21532. “Global sea level linked to global temperature” but which way does cause and effect work? You CAN’T say atm temps warmed the ocean conductively because on average global ocean temps are about 3 C warmer than atm and ocean leads atm (or atm lags ocean) and you CAN’T say atm temps warmed the ocean radiatively because DLR is an ineffective heating agent. You CAN’T say DLR acts as an insulator at the skin layer inhibiting heat escape by conduction because DLR only penetrates 10 microns and besides, the radiative and evaporative processes still work..
You CAN however say ocean temps warmed the atm conductively, radiatively and evaporatively. So what warmed the ocean if it wasn’t DLR? I’m betting on solar and geo sources of heat because there ain’t no other. That doesn’t leave much room for anything scary to happen anthropogenically. Model predictions in the early days showed considerable wobble as more and more factors were taken into account, but in recent years they have become remarkably stable – the fit to past observations remains very good and it is this fit that gives the basis for future predictions. I want to explore why there is a debate and its implications about this. But suffice to say that the scientific community has accepted the weight of evidence that anthropogenic climate change is highly probable and that at some time in the not too distant future it will have significant impact on the planet’s biota. This is a consensus view of every significant scientific body that has examined the question. True, there remain uncertainties as to how fast warming will occur and to what degree, and there also remain many technical questions. The general view, however, is that sometime in the next 50 years the mean global temperature will rise by more than 2 degrees Celsius. The result will be a significant change in ecosystems and the physical landscape. But this view has been widely debated, dominating both domestic and international politics for the past decade. The question has to be why has this debate been so vociferous and why has it meant that we face the risk of a tragedy of the commons. It is of course a classic case of post-normal science where the facts are uncertain; it is a matter of high urgency for action, for if the scientific consensus is correct the action is overdue; it is certainly of high public interest; the stakes could not be higher; and yet there is a problem. Gluckman sees himself in the role of Pielke’s “honest broker”. I see him in the role of parrot. 1. The public has grown to trust scientific disciplines over centuries of “linear science” based on Baconian and Popperian principles. 2. Linear science doesn’t work for complex chaotic non-linear climate issues. But, as policymakers demand that scientists say something, they turn to “post normal science”. 3. This new approach is inextricably bound up with values. They “determine the importance of the gaps left by the evidence”. The values of the scientists decide how much uncertainty is acceptable. 4. Climate change is the only data-based science that presumes to predict the future. This is another departure from well-trusted linear science. 5. How can the public be brought to accept this new post normal science? Why does climate change invoke such vociferous debate? Gluckman claims that he always carefully divides the hard science from the values. In fact, of course, he does no such thing. Next Thursday? Hmm sounds bad. Does Ken Ring know about this? This is from an IPENZ paper on sustainable energy 2004. Is this really what NZ civil engineers accept? Do they really think that climate warming change will cause catastrophic floods, frosts and famines? Does Gluckman actually know anything about climate science? When I heard him interviewed by Paul Holmes a while back, he came across as pretty lightweight.